Aspirin is widely used as a medication for several medical condition. Like any other drug, it should be taken within its therapeutic range because any higher than this may lead to an overdose in the medication [1, 2]. Aspirin is an example of a type of drug known as salicylates. These drugs inhibit the action of the enzyme that is responsible in the production of prostaglandins. The aforementioned substance is known to cause swelling, pain, fever and inflammation. Because of its mechanism, aspirin is used in the treatment for pain, inflammation and fever. 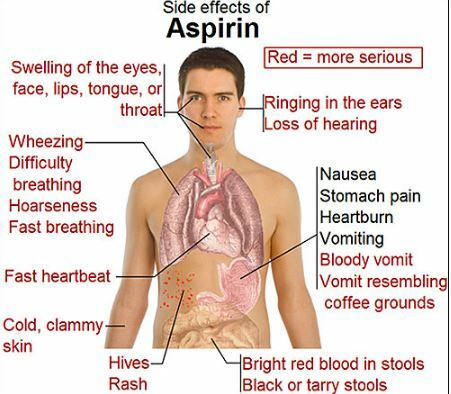 Other uses of aspirin are in the treatment of angina chest pain, stroke and the prevention of heart attacks. Side effects associated with the intake of aspirin include hypersensitivity reaction, stomach pain, convulsions and bleeding. Because of these, aspirin should not be given to patients who has an allergy to non-steroidal anti-inflammatory drug (NSAID), a pre-existing bleeding condition like hemophilia or if they have a history of bleeding in the stomach or intestines [1, 2, 3, 4]. How much is Aspirin Overdose? The amount of aspirin that it would take depend on the weight of an individual. A person who weighs around 150 pounds require about 30 pieces of 325-miligram tablet before overdosing. There are two types of aspirin overdose: acute overdose and chronic overdose. An acute overdose occurs when a patient takes in a toxic amount while chronic overdose occurs as a consequence of long-term aspirin therapy. Children and the elderly are at risk for a chronic aspirin overdose [1, 2, 4]. 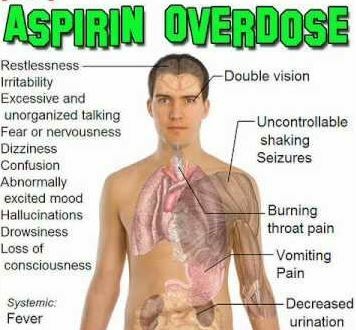 What are Aspirin Overdose symptoms? The initial symptoms that may be felt after overdosing on aspirin are the development of tinnitus or ringing in the ears and hearing impairment. Other symptoms which may appear at this time are hyperventilation or rapid breathing, dehydration, development of fever, vomiting, feeling faint and having double vision. The breathing associated with aspirin overdose are typically deep and rapid while dehydration occurs as a result of vomiting, hyperventilation and fever. The symptoms that would manifest at a later time include confusion or drowsiness, unsteady gait, appearance of bizarre behavior and even coma [1, 2, 4, 5]. What is Aspirin Overdose Management? The initial priority in the management of aspirin overdose is to maintain the airway, breathing and circulation of the patient. An emergency intubation may even be performed in patients who are experiencing severe hypoxemia. Dehydration and electrolyte imbalance will be corrected through the administration of intravenous fluids. If the ingestion occurred less than 1 hour prior, activated charcoal may be given to the patient. The maximum amount of charcoal that may be given to patients are 50g in children and 100g in adults. Care must be given in the administration of activated charcoal in order to prevent aspiration especially in patients whose level of consciousness have been altered. Alakalinization of the urine will also aid in decreasing the amount of aspirin in the system. If the pH of the urine is more than 7.5, reabsorption of aspirin is being prevented. This process must be continuously done until the level of aspirin is lowered to therapeutic levels. A hemodialysis may be performed in patients who have severely high level of aspirin in the blood or are suffering from volume overload or renal failure [1, 2, 4, 5, 6]. How to prevent Aspirin Overdose? Those who are prescribed with this medication can prevent an overdose by taking the medication according to the prescription of the physician especially in children and older people to whom there is a greater risk. Medication bottles that contain the aspirin should be labeled properly and kept in a high place to avoid accidental ingestion by children [1, 2, 4, 5, 6]. Do you have any information about the overdose in aspirin? You can share it in the comment section below. Vane, J. R., & M, B. R. (2003). The mechanism of action of aspirin. Thrombosis Research, 255-258.